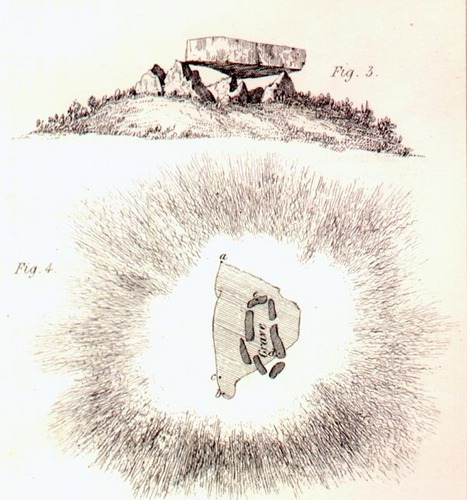 This illustration is taken from the 22nd Report of the Royal Institution of Cornwall which features the earliest detailed description of the monument by Nicholas Whitley: "The Cromlech near Pawten is marked on Martyn's map of Cornwall, as 'an altar of the Druids' it is called by the people in its neighbourhood 'the Giant's quoit'. It stands on a barrow and has a very perfect stone chest, or grave underneath, about eight feet long. The covering stone is quartz and about two feet in thickness, the length from a. to b. about twelve feet, its bearing points are very small at the parts e. c. d. The barrow is evidently an artificial mound, and notwithstanding the great weight of the stone it must have been carefully placed in its present situation." At 14¼ tons the 15 feet long by 2½ feet thick capstone is the heaviest in Cornwall.